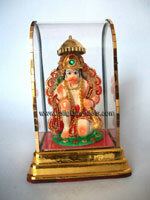 This hand crafted piece of Ganesha is made of Polyresin and is tastefully decorated with attractive colors and stones. 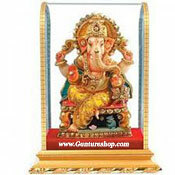 Ganesha Idol is attributed as a symbol of knowledge, wisdom, education, wealth and Good Luck. lead time 2 - 3 working days . This hand crafted piece of Dholak Ganesha is made of Polyresin and is tastefully decorated with attractive colors and stones. 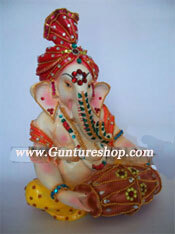 Dholak Ganesha Idol is attributed as a symbol of knowledge, wisdom, education, wealth and Good Luck. lead time 2 - 3 working days. This hand crafted piece of Iskon Radha Krishan is made of Polyresin and is tastefully decorated with attractive colors and stones. Radha Krishan Idol is attributed as a symbol of love, sense of peace and satisfaction in your heart or deep soul. . This hand crafted piece of Kamal Radha Krishan is made of Polyresin and is tastefully decorated with attractive colors and stones. 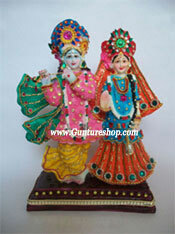 Radha Krishan Idol is attributed as a symbol of love, sense of peace and satisfaction in your heart or deep soul. . This hand crafted piece of Kamal Radha Krishan is made of Polyresin and is tastefully decorated with attractive colors and stones. 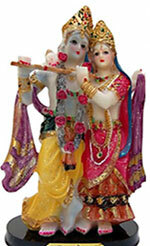 Radha Krishan Idol is attributed as a symbol of love, sense of peace and satisfaction in your heart or deep soul. 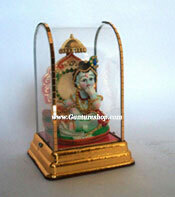 This hand crafted piece of Krishna is made of Polyresin and is tastefully decorated with attractive colors and stones. 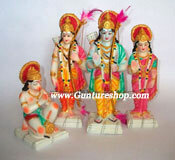 Krishna Idol is attributed as a symbol of love.. 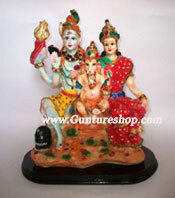 This hand crafted piece of Hanuman is made of Polyresin and is tastefully decorated with attractive colors and stones. Hanuman Idol is attributed as a symbol of strength and provides protection against evils and accidents and acts a security guard. -out of stock. 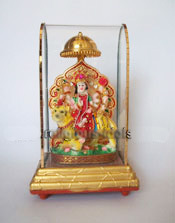 This hand crafted piece of Maa Durga is made of Polyresin and is tastefully decorated with attractive colors and stones. Maa Durga Idol is attributed as infinite power of Universe and as a symbol of a female dynamism. . This hand crafted piece of Maa Saraswati is made of Polyresin and is tastefully decorated with attractive colors and stones. 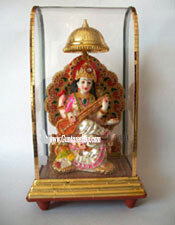 Maa Saraswati Idol is attributed as a symbol of Knowledge, Music and the Art. .